Did you miss the New Year’s celebration? You’re not alone. It passed by with scarcely a notice. I’m talking about the Church New Year—the beginning of the Advent Season. Yes it’s wonky stuff, but bear with me. Christians sometimes speak of the three comings of Christ: in the flesh at His birth, in our hearts each day, and when he returns in glory at the end of time. From the earliest of times the period of Advent was marked by fasting and penance, making one’s heart ready to receive the Lord. The season offers the opportunity to share in the ancient longing for the coming of the Messiah, and to be alert for his Second Coming. It may surprise you to know that for most of its history, Christmas was not considered a major holiday. It only began to grow in importance in the Middle Ages but even then it was alway seen as less significant than Easter and Pentecost. You most likely have heard how pagan mid-winter celebrations were gradually blended in with the celebration of Christmas and how many of the customs now associated with Christmas were borrowed from pagan beliefs. Then as now, it was the feasting and drinking, the exchange of gifts, and general merriment and excitement that raised the stature of Christmas. Unlike today, this period of festivity was confined to the twelve day period from Christmas Day until the Epiphany. The Advent period leading up to Christmas was always a somber period of fasting and prayer. This was reflected in the purple altar paraments, the somber music, and bible readings that did not concentrate on the Christmas story, but on man’s wretched condition. Advent was not a time of joy. It is only in the last two hundred years or so, that we have seen Christmas rise to be the most important holiday of the year. The celebration of Christmas has spilt over into Advent. So much so that in most people’s minds, Christmas starts the day after Thanksgiving and is officially over on December 26th. While, from a theological perspective, the resurrection of Christ at Easter is way more important event than the birth of baby Jesus, even in the Church Christmas is our number one celebration. But this modern celebration of Christmas does not lend itself well to fasting, meditation, and penance. How can you be sorrowful when Christmas carols are in the air?. Who wants to spend four weeks being sad and mournful? Instead, in the last 40 or 50 years, we have seen the entire season of Advent become one long celebration as we countdown the days to Jesus’ birthday. Instead of being the 12 days from Christmas day until Epiphany, we now celebrate Christmas from midnight on Thanksgiving Day until December 25. We changed the altar paraments from somber purple to blue, the color of anticipation and we sprinkle a few upbeat hymns in our Advent services. Advent itself is a relic of the past. You can’t be blamed for missing its arrival. Nevertheless, it remains a good idea. It’s easy for us to lose track of Christ in Christmas in spite of our best efforts. In some churches, there is so much hard work and preparation for the special Christmas services that the actual worship almost gets pushed aside. 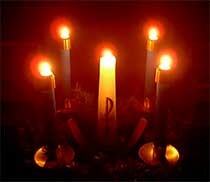 We find it hard to squeeze an Advent service in what is already a hectic schedule. It’s not pleasant to contemplate, but the reason Jesus was born was so that he could be crucified for our sins. He was born so that He could die.